©Barry Sandland/TIMB – On site repairs, for free, has to be a strong draw to getting under financed students back on their bikes. 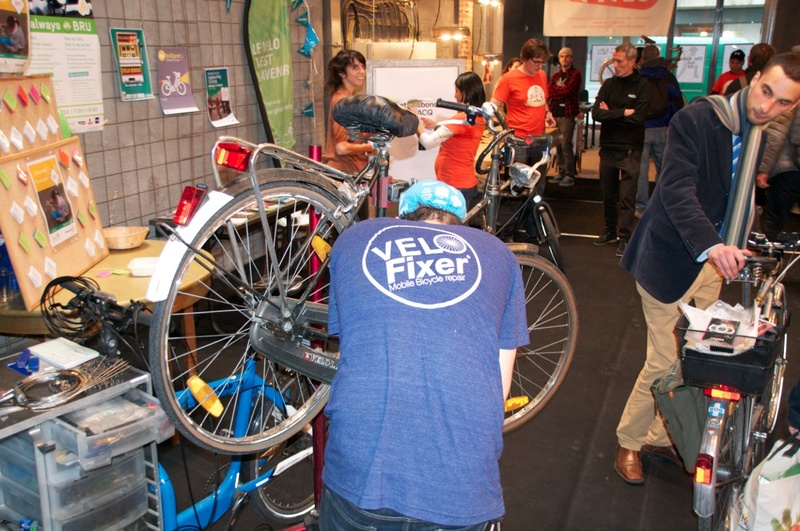 Velofixer mechanics, alongside their Cyclo counterparts, were offering free and immediate repairs for students with malfunctioning rides who attended the Brik second-hand bike market. For under-financed students, the free service was a great opportunity to get their faulty bikes back on the road in a safe form. Photographer’s notes: Brik had a great event with the bike market. The collection of vintage bikes on sale, and the opportunity to get whatever bike they currently owned repaired and up to speed. I have to admire these mechanics. Bring a bike to a store and mechanics can ponder the problem and, perhaps, do some trial and error. These on-the-spot repairs force the mechanic to respond immediately. Granted, so many of the issues are just brake rubbers and an untrue wheel, but there will be the occasional delights where they will have to make great efforts to send the bike out, repaired and roadworthy. This entry was posted in advocacy, bike shop, Europe, event and tagged 2015, Brik, Cyclo, October, Velofixer. Bookmark the permalink.